My parents grew up in Rock Hill S.C. which is a beautiful town in a mostly rural part of upstate S.C. I worked with my Uncle Wade Fairey to create this art to benefit Historic Rock Hill preservation. 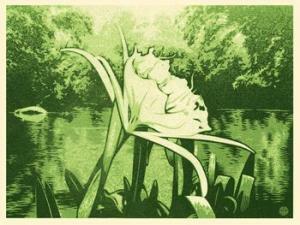 The story of the Courtney Spider Lily art is that it is a rare flower thriving in the Courtney Island section of the Catawba river. The art is designed to promote water quality on the Catawba River which has been greatly affected by “run off from urban development”, bird – wildlife habitation and “availability of movement along the Catawba”, which has resulted in a 100’ buffer on either side of the river. There are many individuals and groups interested in seeing the Catawba remain a lovely river.